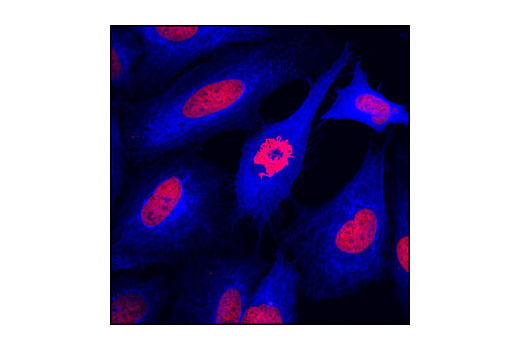 Confocal immunofluorescent analysis of HeLa cells using Pan-Keratin (C11) Mouse mAb #4545 detected with Anti-Mouse IgG (H+L), F(ab')2 Fragment (Alexa Fluor® 647 Conjugate) (blue). Red = propidium iodide (fluorescent DNA dye). 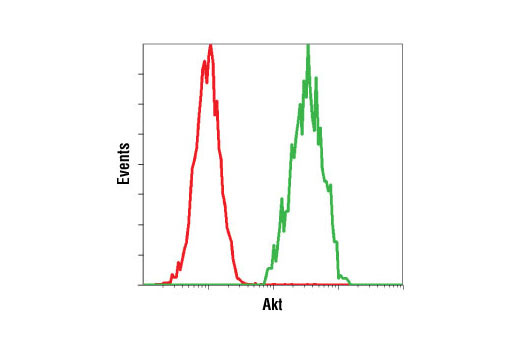 Flow cytometric analysis of untreated Jurkat cells using Akt (5G3) Mouse mAb #2966 detected with Anti-Mouse IgG (H+L), F(ab')2 Fragment (Alexa Fluor® 647 Conjugate) (green) compared to a nonspecific negative control antibody (red). High content analysis of C2C12 cells exposed to varying concentrations of U0126 #9903 for 2 hours. 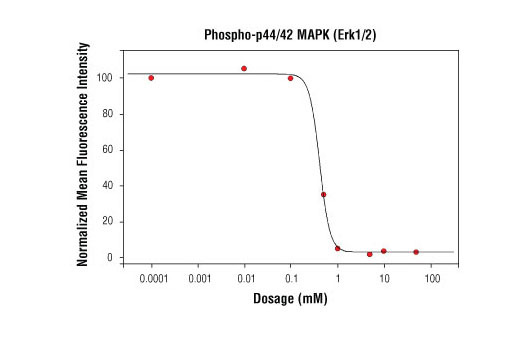 With increasing concentrations of U0126, a significant decrease (~20 fold) in phospho-p44/42 MAPK (Erk1/2) (Thr202/Tyr204) signal as compared to the untreated control was observed. When using Phospho-p44/42 MAPK (Erk1/2) protein as a measurement, the IC50 of this compound was 2.5 μM. Data was generated on the Acumen® HCS platform using Anti-Mouse IgG (H+L), F(ab')2 Fragment (Alexa Fluor® 647 Conjugate). Anti-Mouse IgG (H+L) F(ab')2 Fragment was conjugated to Alexa Fluor® 647 fluorescent dye under optimal conditions and formulated at 2 mg/ml. This F(ab')2 fragment product results in less non-specific binding, as it lacks the Fc domain that can bind to the cells with Fc receptors.